Amazing-Green-Tea.com is a member of the American based Specialty Tea Institute. In compliance with the US FDA Bioterrorism Act 2002, we are represented by the Tea Association of the USA, who served as our US agent. 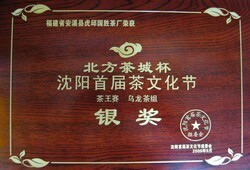 That means we are authorised by the US Food and Drug Administration (FDA) Department to ship tea leaves directly to the United States from China. Other countries do not have similar requirements. 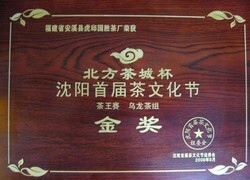 The site co-founder - HQ - who does the sourcing and warehousing, plus post office runs, is a certified tea taster. On the right is a picture of him when he was in his early 20s - adorned in traditional Chinese "uniform". HQ's uncle, who owns a neighboring tea garden, was crowned in April 2002 as the Tea King, because of his mastery of the "10 hands movements". Shen, owner of the superlative Iron Goddess oolong tea, boosts a few King grades who have won quite a few awards over the years. 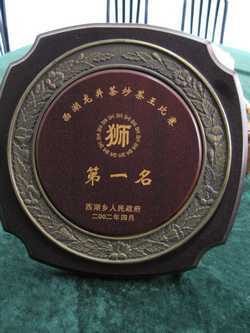 During the Shenyang Tea Exposition Fair of October 2008, they did a clean sweep by winning both the gold and silver medals.